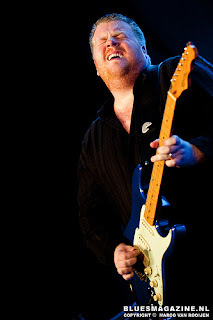 Danny Bryant is currently one of the top up and coming acts on the blues rock scene. Hailing from Hertfordshire, England, Bryant has released seven albums with his latest release “Just As I Am” receiving much high praise. Bryant is now set to record his first live DVD in September and filled us in on the details in this exclusive interview. Your most recent album “Just As I Am” was one of the better blues rock releases of 2010. Is a new album currently in the works? We are recording our first ever live DVD in Holland this September, we have had so many requests to do this that the time just seems right. We will also release it as a live CD. After that we will think about another studio album. What can we expect from the live DVD? We are going to be playing songs spanning all my studio albums from the past ten years which allows me to pick what I feel are our best songs and present them in a live setting. I am really looking forward to it as those songs have evolved over the years of playing them live and in most cases are a little different to how they were when we first recorded them in the studio. What is the biggest difference between your live shows and studio work? I think everybody has a tendency to polish their studio work a little more. In a live situation you play a solo and it has more freedom in it because you don’t have that thought in the back of your head saying “this is going down on tape and will be there forever!” It’s there and gone so to speak, which often makes it have a bit more freedom and excitement! That is really what I hope to capture on this dvd. What is your favorite song to play live currently? I would have to say my favorite song to play at the moment is “Just As I Am.” I like playing ballads best of all really and that song seems to strike a nice balance between a ballad and something with a bit of balls to it! Walter Trout has been a big influence on you and you’ve had opportunities to play with him before. Is there anyone else you’d really like to have a chance to play with? Walter has always been fantastic to me, a great friend and a huge influence, by strange coincidence I am jamming with him tonight, as he is in the UK on tour at the moment. Popa Chubby is another big influence and now a friend and I am proud to have jammed with him a couple of times also. Having these mentors is important I feel. As for the question who else would I like to play with the list is endless, but if I could jam with anybody I would have to say Buddy Guy. I have met him and opened for him a couple of times on festivals but to jam with him would be amazing! You tour all over Europe, what are your thoughts of possibly touring the US in the future? It is something that I am sure will happen in the future, and of course something I would love to do! I did actually have a nice tour booked over there a couple of years ago but we had a lot of trouble getting the correct work visas in time. I get lots of really nice emails from the US and I very much hope that we can get there very soon. Your father plays bass and your mother manages you, what is it like traveling in a family band? It is a fairly unique situation but I have never really known any different and for us it works great. I am glad that we get to do this as a family, I wouldn’t want to change it. We have a summer of playing some nice festivals leading into September and the recording of the DVD/CD, then we will go back out on the road playing clubs all across Europe to promote it!